Upgrading your home with smart devices no longer an option — it’s a must. It’s official: smart home upgrades are HOT. A 2016 survey cited in the Washington Post says that 65 percent of buyers, especially millennials, are willing to spend more on homes that are equipped with smart devices. 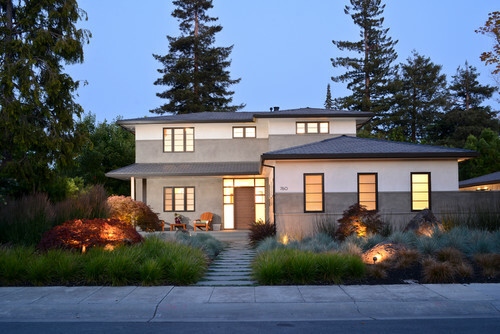 Moreover, today’s definition of a move-in ready home has shifted. It’s not just about fresh paint and refinished hardwood floors anymore. An increasing amount of buyers don’t consider a property “move-in ready” until it’s equipped with smart gadgets. Combine this with the fact that a Coldwell Banker survey found that 71 percent of buyers desire a move-in ready home, and you’ll understand why upgrading your home with smart devices no longer an option — it’s a must. But which upgrades are worth your time and money? Here are some low-cost, high-ROI smart gadgets to install when you’re ready to list your home. In addition, buyers prefer upgrades that stay with the home when you sell it. They want permanent gadgets that can be integrated with any voice command unit they bring when they move in. You don’t have to spend a fortune to make your listing more appealing. In fact, you can find many of these “quick win” devices for under $300 each, with plenty hovering around $100. Thermostats. One of the most popular features in a smart home is the Wi-Fi-connected thermostat. This device allows you to not only program the temperature changes throughout the day for energy savings, but also to control the temperature by voice or even through an app when you’re away from home. Smoke, Gas, and CO Alarms. Common threats to your safety require prompt notification. Imagine being able to know if your house is on fire or experiencing a gas leak even when you’re away. With smart alarms, it’s possible. Connected alarm systems notify the owners of any safety issues within the home, wherever they are. Security Systems. There are plenty of smart-home security systems on the market that can be controlled by phone or voice command. That means homeowners can arm and disarm the system without fiddling with a complicated keypad. They can also view video streams and notify police of an emergency from their phones. These systems can even include window sensors, motion detectors, and much more. Lighting. Smart lighting allows homeowners to dim or turn lights on and off with a simple voice command. Plus, if they ever forget to turn off the lights, they can easily do so from their phones — even if they’re at work. Connected lights can also act as a de facto security system. By simply setting the lights to a randomized pattern, it can create the appearance that the home is occupied, potentially scaring off any would-be intruders. Garage Door Openers. Garages are a popular point of entry for homeowners, but they’re also a common security breach. That’s where smart garage door openers come in. These devices can notify homeowners when the garage opens and closes and allow 24/7 monitoring of the garage. The doors can also be opened and closed remotely through a smartphone. Video Doorbells. Your home’s new owners won’t even need to get off the couch to find out who’s at the door with this smart upgrade. Video doorbells are equipped with motion detectors and 24/7 surveillance, which will notify occupants that someone’s at the door, even if no one rings the doorbell. If you’re ready to put your house on the market, you’ll need to make sure your property stands out from the competition. Investing in a few low-cost smart home devices can help you do just that, and it could pay dividends when your home sells. Jon Snyder is a Product Manager at Esurance. He oversees countrywide design of property insurance products. Jon has over 25 years of industry experience in product management, design and management roles, as well as claims roles at Esurance and other major industry carriers. You can find out more about how smart home products can help you save on home insurance by visiting Esurance.com. From price and location to the physical structure itself, the list of things to keep in mind when shopping for a house can seem endless. But some problems you encounter don’t need to affect your final decision. From price and location to the physical structure itself, the list of things to keep in mind when shopping for a house can seem endless. But some problems you encounter don’t need to affect your final decision. Although easy is a relative term, accomplishing the 10 fixes that follow is generally pretty straightforward. We also point out some big-ticket fixes to watch out for. Happy house hunting! 1. Easy fix: Repaint or reface existing cabinetry. 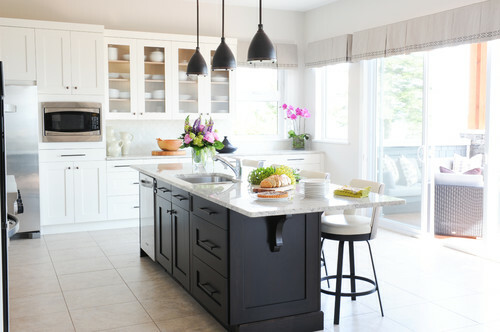 If the interior structure of the cabinetry is still sound, refinishing, repainting or refacing (replacing the cabinet fronts) can be a more cost-effective way to refresh a dated kitchen than completely replacing the cabinetry. 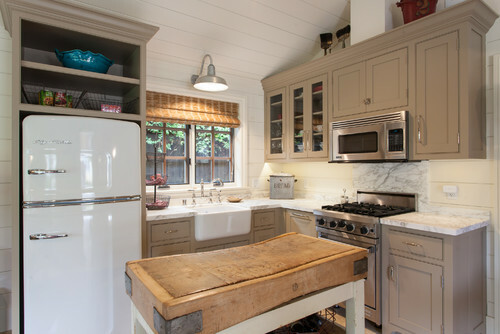 If the cabinet doors are in poor condition or you want to change the style, consider refacing. 2. Easy fix: New appliances. Swapping out old appliances for shiny new models is one of the biggest-impact ways to make over your kitchen without getting bogged down in a full remodel. And because the cost of appliances and installation is pretty straightforward, it’s easier to plan and budget for this upgrade than projects that might expand beyond your original scope. Not-so-easy fix: New kitchen layout. Replacing what’s already in your kitchen is one thing, but when you start to move the plumbing and electrical around, costs can rise quickly. If possible, go for a house with a kitchen that has a layout you’re happy with — you can always tweak the details. 3. Easy fix: Fresh carpeting. Stained, worn-out carpeting is a real bummer, and it can be hard to see past it when viewing a potential home. But ripping out old carpeting and putting in something new — especially something as fresh and fun as the colorful carpet tiles shown here — can make a huge difference in how a space looks and feels. 4. Easy fix: New paint color. It’s amazing the effect color can have on us — remind yourself of this fact the next time you tour an open house with some (ahem) unusual color choices. 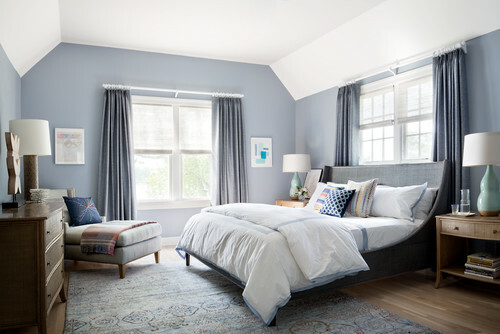 You can easily (and cheaply) replace any wall color with a beautiful hue, like the lovely silvery blue shown here. 5. Easy fix: Replace light fixtures. Swapping out dated light fixtures with new ones you love is a quick and easy fix an electrician or DIY-savvy homeowner can accomplish in relatively little time. 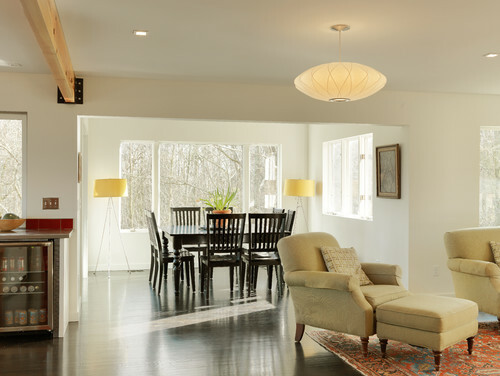 From modern pendants (like the saucer version shown here) to Edison-bulb chandeliers, there’s a light for every style and taste. Not-so-easy fix: Extensive electrical work. Exchanging one light fixture for another in the same spot is simple; updating old or unsafe systems is another matter entirely. Electrical work should definitely be left to the pros, and electrical repairs in an older home can cost a pretty penny, so be sure to get a thorough inspection and review it in detail. 6. Easy fix: Repurpose a room. Just because a room is shown as a messy kids’ room or workout space doesn’t mean that’s what will make the most sense for you. As you tour potential new homes, think creatively about the spaces you see and try to imagine your own furniture in them. 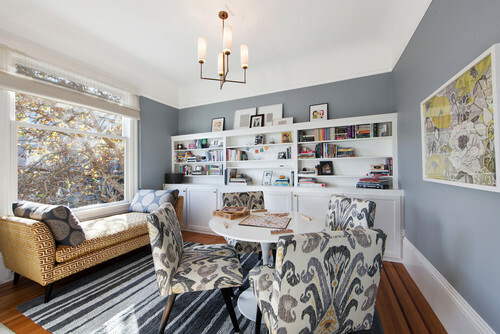 One person’s overstuffed home office could be your perfect sun room. Not-so-easy fix: Adding on. 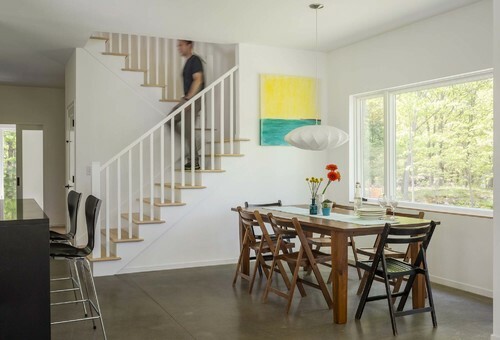 Remodeling costs get a whole lot bigger whenever you talk about changing the footprint of a home, so try not to be seduced by talk of how “easy” it would be to tack a room on to the back of the house. Although there are always exceptions, your best bet is usually to find a house with a footprint you can work with. 7. Easy fix: Remove or cover up popcorn ceilings. Not much dates a house like the lumpy, bumpy texture of a popcorn ceiling. Thankfully, fixing it isn’t too complicated, and you’ll soon have a nice, smooth ceiling. The most common method is simply scraping it off, but if there’s any chance that lead and-or asbestos might be present in the paint or the popcorn material itself, you’ll need to cover it up with drywall instead. 8. Easy fix: Add architectural interest. If you love the look of older homes with lots of original architectural details but haven’t been able to find the right one at the right price, it’s still possible to get some of the detail you crave, even in a newer build. 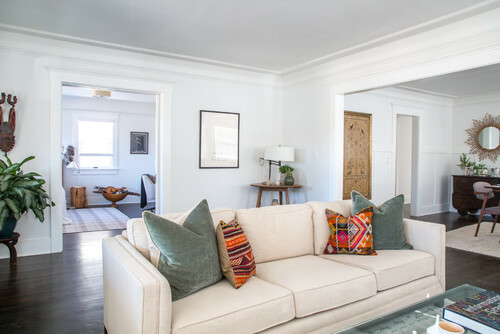 Crown molding, baseboards, picture rails and even built-in features like bookcases and bench seating can be added by a carpenter to give a boxy new build added character. It’s an extra cost, but it’s not especially difficult, and it can make a big difference in how you experience a home. 9. Easy fix: Refinish floors. If you’re lucky enough to spot a house with real wood floors, don’t let a dull finish turn you off. While engineered hardwood can usually be refinished only a few times during its life (the number depends on how thick the veneer is) solid hardwoods can take a lot more, so you can have gorgeous, glossy floors (or artfully beat-up floors if you desire) for years to come. 10. Easy fix: Add landscaping. Yard looking a little bare? 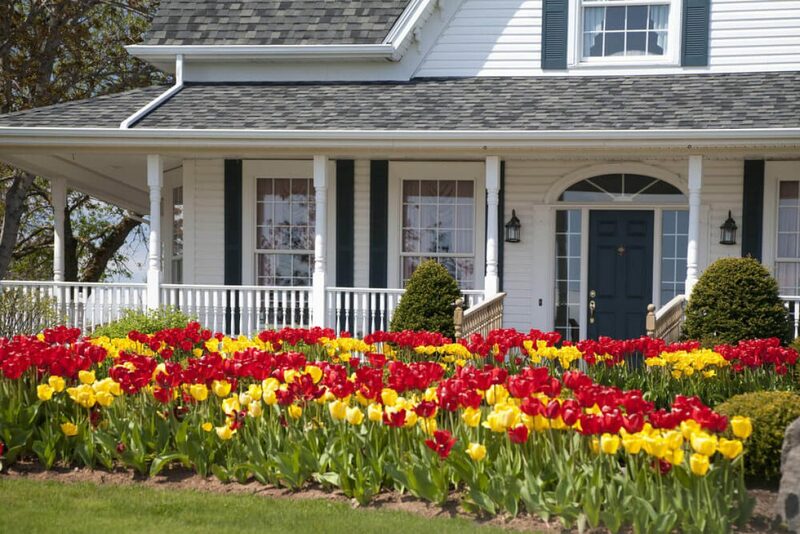 Adding landscaping, whether a simple DIY job or a landscaping pro’s design and installation, is something that can make a huge impact on curb appeal and, more important, how you feel when you come home each day. To get that hotel vibe, focus on these areas of your home. When it comes time to sell your home, you need to keep one thing in mind: buyers don’t want to see or feel you in the house. What we mean is that buyers are looking for a blank slate that they can envision making their very own. They don’t want your family pictures, unique style, or lived-in look. Instead, they want a house that represents endless opportunities. How do you make this happen? How do you get YOU out of the house when staging a home for sale? Think about giving your home a hotel vibe. It’s one of the most successful open house ideas because it’s all about making your home into anyone’s house. 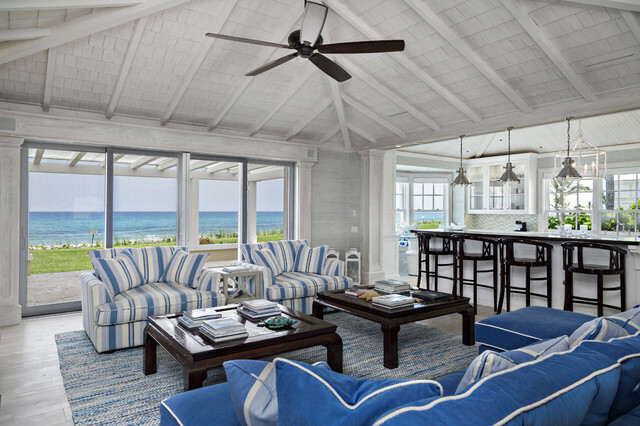 Staging your home so that it feels like a hotel will help you sell it faster and for more money. But what does this look like? Your real estate agent will be able to give you expert advice on how to achieve this. To ensure you have that hotel vibe, you’ll need to go through your home room-by-room and focus on a few key areas. The entrance of your home is your one and only chance to make a great first impression, so you’ll want to make your entrance look and feel like a hotel lobby. If you have room, consider adding an elegant table with artfully arranged flowers. You’ll also want to keep it clear of clutter to ensure that it creates a welcoming feeling. Bedrooms are typically the most personal rooms in a home, and so, for an open house, they should be depersonalized as much as possible. Remove all personal items from dressers and nightstands. It’s even a good idea to half empty your closet so that it looks neat, clean, and larger than normal. In addition to cleaning up, you’ll also want to transform your bedroom with plush bedding that’s reminiscent of a hotel room. Think white linens with throw pillows and crisp lines. It should feel like a hotel room from the moment they walk in the door. When staging your home for sale, your bathrooms should look brand new. This means emptying out cabinets and drawers of any toiletries and miscellaneous items. You should also allow a small budget for repainting, changing out old fixtures, and resurfacing countertops. As for the towels and décor, only use brand new items that are perfectly spotless and would look appropriate in a hotel. Every bathroom should feel like an oasis. All successful open house ideas start in the kitchen. That’s because a kitchen, if done beautifully, can get you more than your asking price while an ignored kitchen can kill a sale just as quickly. Remove clutter from countertops until they’re completely clear. Clean all appliances and replace old, worn out equipment. Clear all dishes and keep them neatly stacked out of sight. Organize every single drawer, removing extra items. Empty out the pantry and fridge until only a few food staples remain in neat rows. Clean and de-clutter your kitchen until it wouldn’t look out of place on a food show. Only then are you ready for an open house. What about the rest of your house? There are quite a few things you can do to create that hotel vibe everywhere. Bring in Light: Maximize the light throughout your home by removing drapes, cleaning windows, changing lampshades, and increasing bulb wattage. Choose the Right Colors: Don’t slather your walls and furniture with bright, bold colors. Instead, follow the examples of upscale hotels with neutral palettes of warm gray, taupe, brown, and even black. Create More Space: Add large mirrors and use appropriately proportioned furniture to create the illusion of more space in tight quarters. Don’t Forget the Exterior: Don’t forget the outside of your home. Transform your back deck into a cozy outdoor living area, and make sure your front yard leaves a good first impression with a spruced-up yard, fresh exterior paint, and pops of color. 5 Crazy Ways to Sell Your House That Really Work!